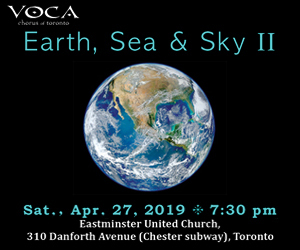 Three dramatic song cycles by Canadian composer Andrew Staniland comprise this exciting, intense, rewarding release performed with respect, musicality and technical prowess by soprano Martha Guth, baritone Tyler Duncan and pianist Erika Switzer. Each showcases the composer’s innate ability to combine words and sound to create thought-provoking, quasi-programmatic works. Earthquakes and Islands, a setting of Robin Richardson’s poetry, is a tour de force, an eight-movement work exploring the emotional aftermath of a relationship gone wrong. This is high intensity, contrasting music verging on the disturbing. The first section’s opening dramatic piano trill and soprano held notes, subsequent almost-over-the-top low piano crash and low pitched chords contrasting the soprano line set the stage for the entire work. The almost-spoken baritone part in Future Perfect’s third section has the piano atonal lines double the vocals to the calming ending. In My Voice, In My Mouth, dramatic piano low chords, distressed soprano vocals, huge loud and reflective quieter sections support the cancer patient’s feelings of panic/calm. The closing Go By Contraries is just that, as piano string glissandos set up the vocal duet to the closing ascending buildup and final piano fade. Peter Quince at the Clavier, using a Wallace Stevens text for baritone, and Execution Songs for soprano, feature more of the same intense soaring vocals, piano textures and wide ranging dynamics. Maybe a bit too melodramatic, but these great compositions, production and performances must be heard! Soprano Leslie Fagan and pianist Lorin Shalanko, both international performers and professors of music at Wilfrid Laurier University, are devoted to showcasing Canadian composers through their Canadian Art Song Series, which premiered with the release of Thread of Winter in 2016. This second recording in the series, which takes on the theme of love and romance, is bursting with heartfelt and melodious pieces performed with great warmth and passion. Since the prelude to romance is often a meal, the recording begins with the witty David L. McIntyre’s Creek Bistro Specials in which a sumptuous (and very Canadian) menu, from appetizers to desserts, is extravagantly presented in song. Nestled within the mains is the title track Halibut Cheeks and one can’t help but note a clever nod to Schubert’s Die Forelle in the piano part at the end of the Grilled Trout course. In the selections that follow, the performers mine exquisite depths of emotion, first with Lionel Daunais’ Cinq Poèmes d’Éloi de Grandmont, then with Srul Irving Glick’s sensuous Seven Tableaux from the Song of Songs. Gorgeous selections by Matthew Emery and Michael Coghlan by turn frame Gladys Davenport’s Cool and silent is the lake, in which Fagan and Shalanko delicately evoke a sense of wonder at nature’s tranquility. New Brunswick’s Louisbourg Choir celebrated its tenth anniversary in this collaboration with the Skye Consort, a gifted early music ensemble whose mandate is to craft their own contemporary arrangements of seldom-heard vocal and instrumental pieces. For the first section of this recording, cittern-player Seán Dagher has arranged a number of charming selections from the Chansons folkloriques d’Acadie-La fleur du rosier and Chansons d’Acadie collections. Songs of love, travel, adventure and everyday life are delightfully and unreservedly performed by this accomplished choir, interspersed with spirited instrumentals by the ensemble. The second half of the recording features chansons by little-known composer Jacotin Le Bel (1495-1556), who served in the royal court of France during the reigns of François I and Henri II. Here, the choir shines as director Monique Richard deftly leads them through the complexities of vocal polyphony and luxuriant voicings reminiscent of Josquin des Prés. In these renderings, one appreciates the small size of the chorus. With four or five to each vocal part, the singers are better able to navigate the fluidity of long melismas and realize greater clarity of text. Again, the Skye Consort intersperses with enchanting interludes. The American soprano Bethany Beardslee, perhaps best known for her work with many of the major figures of 20th-century composition – most notably her interpretations of the work of the Second Viennese school and the American composer Milton Babbitt – tackles a decidedly Romantic compositional set on this 2018 Bridge release of a set of mid-1980s recordings. Although Beardslee is on record eschewing music that is simply entertainment and for the masses (articulating a similar proclamation to the 19th-century French slogan “Art for Art’s Sake” with her 1961 declaration, “Music is for the musicians”), Beardslee reveals herself to be a sensitive and appropriate interpreter of these Romantic-era masters. Well accompanied by the fine pianists Richard Goode and Lois Shapiro, modernism be damned, as Beardslee teases out the subtle nuances and effervescent rhythmic feeling of these composers, particularly so on Franz Schubert’s bridging work between the Classical and Romantic eras. Of note here is the beautiful minor lied Gretchen am Spinnrade, which reminds listeners of the fact that the Faust legend remains relevant fodder for interpretation and exploration. With able accompaniment and clarity of recording, these compositions are not presented as ossified period-piece repertoire, but rather joyful texts capable of lifting the spirit.